Welcome to the world of crocheting. Sure, its not a big new thing. Neither is the art of amigurumi. What is neat is when you take the art of crochet and you transform it into aspects that others can love. 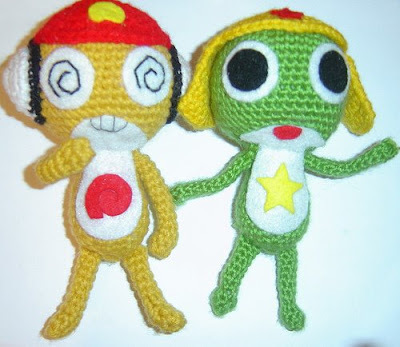 Such is the case when I see crocheted frogs named Keroro and Kururu created by craftster puchitomato. There are more crocheted goodies on puchitomato's blog but this just made me giddy all over. My husband looked up from the MarioKart Wii game trying to figure out what was wrong with me. Silly Mister. This little critter was made by craftster instantkarma as a gift for a friend. 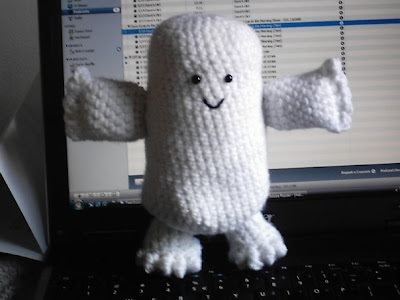 It really is terribly adorable but then again, so were the adipose. While I have always said that I know how to crochet I have yet to learn the art of making the crochet dolls. I just don't think I'm that patient yet. I really admire people who take the time to figure it out. Above all I really enjoy seeing people step outside the traditional concept of what crocheting is or can be and watch them evolve it into something that other not-so-crafty people can love.